Buy this quiz at a discount when you purchase this in my Earth Science Quizzes Bundle (and EVEN CHEAPER if you buy them in my new MEGA BUNDLE Biology/Life Science & Earth Science Quizzes). You will need some type of zip file (free download on the net) as this file is in pdf form. 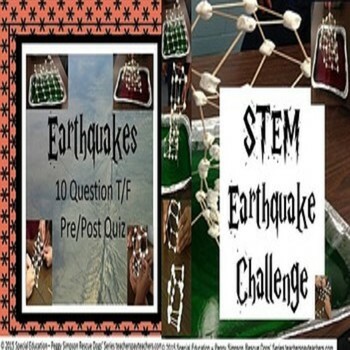 Earthquakes quiz ten (10) question True/False quiz and a fun extension PDF of a STEM Earthquake Simulation Challenge. This one quickly goes back over some plate tectonics and earthquakes. 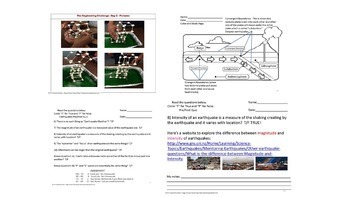 Students take the pre-test - study the detailed answers and watch the online video/interactives, read the student friendly earthquakes notes pages and then take the post test (when the student is ready). 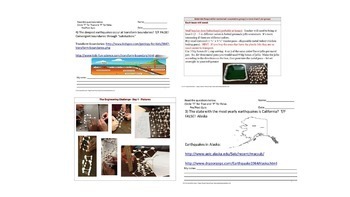 Can be used for 6th or 9th grade Earth Science Special Education or English Language Learner students (or anyone who needs a little help in Earth Science). Some pages are editable (on the nonrestricted graphics pages). Thanks for looking and have a great day! Make sure and check back as I'll be adding more quizzes for Earth Science in the next few weeks. 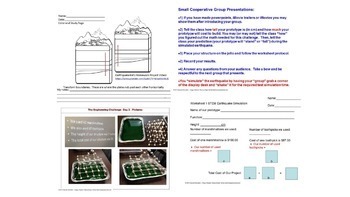 In powerpoint form and STEM Extension in PDF form.